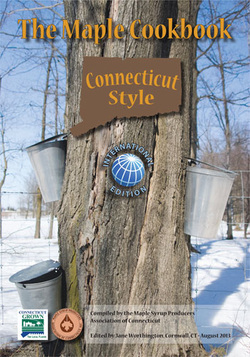 The Maple Cookbook, Connecticut Style, International Edition is now available. The book includes over 150 recipes from friends and family, including 26 from chefs all over Connecticut. In addition to the original 150 recipes printed in English, 25 of those recipes have been translated into French, Italian and Spanish (with appropriate metric and Centigrade notations). You'll find lots of tasty new ways to enjoy maple syrup. The cookbooks are $20/each. If you are interested in getting one, or multiple, copies send a note to info@ctmaple.org with your request. The production of this International Edition was made possible with funding from the Federal-State Marketing Improvement program of the Agricultural Marketing Service, U.S. Department of Agriculture, the Connecticut Department of Agriculture and the Connecticut District Export Council. On Sunday, October 11, Tracey Medeiros, coauthor of The Connecticut Farm Table Cookbook featured a recipe from the cookbook - a Maple Pecan Bourbon Pie on WFSB Channel 3 Connecticut using CT maple syrup.